I'm in a writing funk. There. I said it. I'm so tired, taking pictures has become such a task and I'm working so so hard with other projects that my brain feels a little blah by the time I need to write a post. So I don't. But I think one great way to work out of a funk like the one I'm in is to just write about what you're thinking. The things you find yourself talking about anyway. Write it down. To remember what was on your mind and get it all out there. It can feel so great to do that, to write just for yourself without worrying too much about what others want to read about. It can get overwhelming. You know? Anyway, so often when my husband and I talk about life - our babies, our goals, our relationships with each other and others, we find ourselves back at a similar topic. Things from our childhood and past that make us tick the way we do. Why certain things are more important to us and so ingrained. For me, so much of that goes back to my parents. My parents didn't have the most ideal childhoods, for very different reasons. Regardless of the reasons, the fact remains the same. They came from beginnings that didn't set them up for the most successful lives. But the thing about my parents is this. They are fighters. They work hard at everything they do. These are things that I will never forget and that have played such a big part in making my brothers and I the people we are today. I've seen my parents do very well in the secular world, start something new, struggle like nobody's business only to start from scratch and somehow make something great all over again. It was our normal. To watch our parents work hard and give everything they had to build something for us. For their family. And it's paid off. The other day I was thinking more about this and as I tried to sum it up in conversation with my husband, I realized that it came down to three things. Every time I try something new, when I fail, when I succeed and twenty years from now, I want to always remember these three things that I learned from my father. Like I've said, I have watched my dad FIGHT to make something of himself. Sometimes, it can be tempting to take shortcuts or "white lie" your way through something to make it a little easier. But our beliefs don't allow this sort of thinking. And as tempting as it may be, my dad strives to be honest in his business dealings. I believe this is a HUGE part of his accomplishments. And if it wasn't? Then it wouldn't truly be a success, now would it? You could spend a week straight with my dad and I guarantee there is something you will never hear him refer to himself as. A boss. A founder. A success story. In fact, you wouldn't even know that he has done anything worth bragging about ever. But he has. This is something I have always admired. And Never Ever EVER forget to Hustle. It takes hard work. I have never looked at a successful person and thought "he/she is so lucky" because I have seen first hand that luck? Luck has nothing to do with it (unless you're a trust fund baby but you get it). It comes down to how hard you are willing to work your buns off. How much do you really want it? Are you willing to lose sleep? What about a bit of your self-esteem when you are put down countless times throughout the process? Are you willing to give that up? I learned the value of hard work from my fathers' example, not just his words. I watched him sit in a tiny corner of our living room apartment day and night while everyone was using words like "lazy" when what he was really doing was trying to find a way. A way to support his family the way he felt they deserved. A way to build an empire. I will never forget seeing him in that corner. Wondering what on earth he was doing. Now I know. He was proving something that I would one day learn from. Good things don't come to those who wait. They don't come to those who are lucky. No. Good things come to those who hustle. And hustle he did. I hope to one day live up to the example he left us and teach our kids the same way. I know exactly how you feel!! 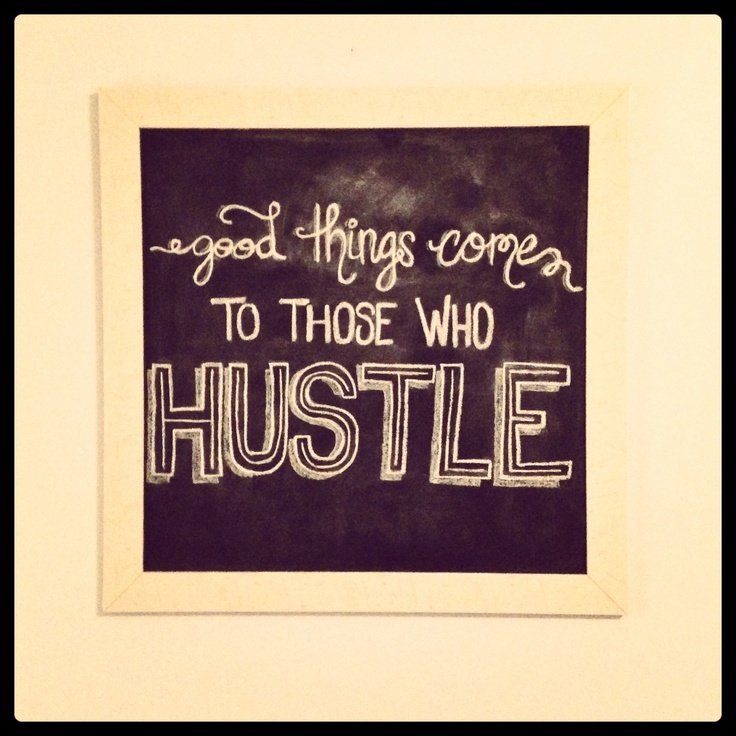 And yes, never forget to hustle! !